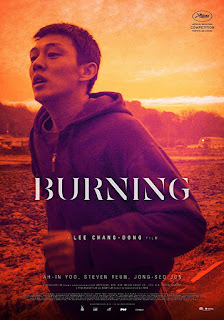 Read Will's review of Burning. 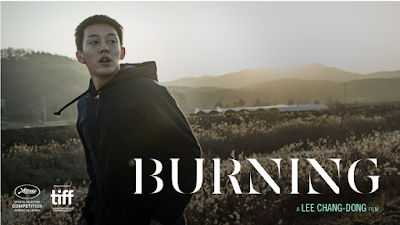 Burning is the searing examination of an alienated young man, Jongsu (Korean star Yoo Ah-In), a frustrated introvert whose already difficult life is complicated by the appearance of two people into his orbit: first, Haemi (newcomer Jeon Jong-seo), a spirited woman who offers romantic possibility, and then, Ben (Yeun), a wealthy and sophisticated young man she returns from a trip with. When Jongsu learns of Ben’s mysterious hobby and Haemi suddenly disappears, his confusion and obsessions begin to mount, culminating in a stunning finale. Burning is in select theaters on November 16th, 2018. Burning is a South Korean movie from respected director, Lee Chang-dong. It is also the countries official selection for Best Foreign Film at the Oscars should it get nominated. This is a drama that slowly shifts into something darker that explores both personal loneliness and longing. It follows Lee Jong-su (Yoo Ah-in), a young man who runs into an old neighborhood friend, Shin Hae-mi (Jun Jong-seo). The two strike up a relationship, and it quickly becomes clear that Jong-su has some strong feelings for her. Just after he stays with Hae-mi for the night she mentions that she's leaving for a short trip to Africa to find herself, and asks him to feed her cat while she’s away. When Jong-su picks her up, she ends up returning with someone else that she met at the airport, Ben (Steven Yeun from the Walking Dead), a seemingly rich man who's backstory is a bit of a mystery. Lee takes care to explore the subtleties of the trio’s relationships and Jong-su’s growing sense of jealousy, before allowing the movie to turn into a full-blown mystery. This is a purposely slow paced movie that I wasn't sure about after one viewing. So I watched it again a few days later and it definitely made a difference. It's a rather simple movie but the pleasure of it comes from the subtlety with which the director shapes the narrative. Jong-su, Hae-mi, and Ben are portrayed with a sense of longing, and shows in different ways. Jong-su is isolated and insecure, seeking a deeper connection with others. Hae-mi seeks to find an outlet for her passions. Ben, is a bit lackadaisical and gives off a very creepy vibe. The tone of the movie first becomes clear when Ben casually makes a confession to Jong-su about his favorite hobby which is a bit strange. For someone so out of touch with reality and bored by the usual pleasures, it’s the one thing that offers Ben satisfaction. Their conversation is the first of the movie’s escalations, and hardly the most shocking. I'll stop there and let you witness the story evolve. With its 148 minute runtime, there are points in the middle of the film where you might start to wonder where the film is going. The pace slows a bit as the film gathers together pieces of seemingly useless information. A product of Lee's use of this technique is that the magical realistic elements silently creep up on you. But once the movie has eased you into its mellow pace and content, it changes gear and almost becomes a different movie. Suddenly, it's an edge of your seat, heart-pounding thriller as I watched all these seemingly innocent scenes fit together one by one as puzzle pieces to the increasingly suspenseful mystery. The last hour or so was intense. A masterfully erected, quietly affecting slow-burn thriller that uses ambiguity to its advantage. Satisfying, with room for the viewer to read into things, it doesn’t waste an ounce of runtime on anything nonessential. With fantastic direction and phenomenal performances, this is something to check out.